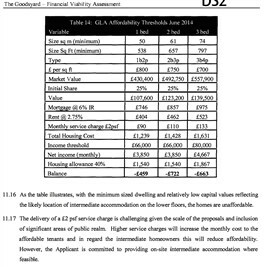 Figures from the redacted Financial Viability Assessment attempt to avoid delivering affordable homes because they would not be affordable. Whilst that may be true, the maths doesn't add up and the assumptions are dubious. 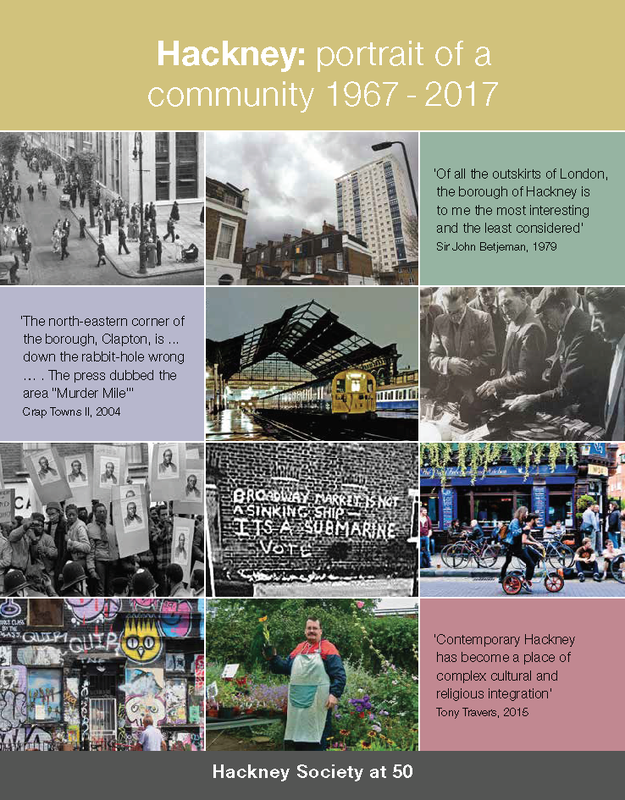 The Hackney Society participates in a loose coalition of groups campaigning under the name More Light More Power to resist the 2014-5 proposals by Hammerson and Ballymore to redevelop the Network Rail site around Shoreditch High Street overground station. It is within two boroughs, Hackney and Tower Hamlets. The road outside Shoreditch overground station (renamed Braithwaite Street) is the borough boundary. The latest plans unveiled by the developers in June 2015 consist of 1,356 residential units, over 65,000 sqm of office space and over 17,000 sqm of retail space; two towers 46 and 38 storeys high, five further towers between 17 and 30 storeys high, and a large floorplate office building twice the height of the Tea Building. Not more than 10% affordable housing has been proposed. The developer’s “viability statement” to back up the small amount of affordable housing has been largely redacted. The Hackney Society have made a number of requests to see this document and other viability appraisals and are actively pursuing it on behalf of More Light More Power. It’ll take 13 years to build and has the potential to change Shoreditch and Brick Lane so there’s no going back. The participants reasons for resisting the scheme in its current form are many and various and on some issues groups do not share the same strength of concern, but we all agree that the scheme in its current form is wrong for the site, given the limited public benefit. The scheme was due to be resolved by Hackney and Tower Hamlets councils, over whose boundary the site straddles, but the Mayor of London has excercised his powers to take over - or "call in" - the decision for himself. The Hackney Society's formal planning response was submitted to both authorities and the Mayor of London in December 2015. You can read it here. Both local planning authorities resolved to oppose the scheme formally, at meetings held 10 December 2015. The GLA has said the Mayor will likely hold his hearing on 11 March 2016. John Biggs, AM is the elected Mayor of Tower Hamlets and London Assembly Member for City & East. He is a member of the Labour Party. Jules Pipe, CBE is the elected Mayor of Hackney and is Chair of London Councils. He is a member of the Labour Party. Jonn Elledge is the editor of CityMetric, the online magazine covering all things urban, launched as a sister publication to the New Statesman in August 2014. He spends far too much time shouting on Twitter about the need to build more bloody houses. Nicholas Boys Smith is a founding director of Create Streets – which promotes and researches policy encouraging low-rise and streetscape developments in place of high-rise towers. He has recently been involved in organizing a community-led alternative design for part of the Royal Mail's massive Mount Pleasant site funded by the GLA. Kirsty Styles (Chair) is a journalist who lives in Hackney. Until recently she was the acting Editor at Tech City News and is now a reporter at The Next Web. She also presents the New Economics Foundation's Weekly Economics PodcastEconomics Podcast. The developers declined our invitation to participate. The GLA were unable to accept our invitation as they had a formal hole in deciding the application. 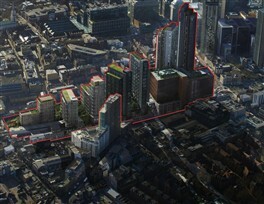 Bishopsgate Goodsyard redacted viability report from Nick Perry on Vimeo. Nick Perry from The Hackney Society shows the developer's redacted Financial Viability Appraisal (FVA) used to justify just 10% affordable homes on the Bishopsgate Goodsyard site, against a policy set for the site at 35% in 2010. The Hackney Society have been pursuing the disclosure of the reports from the developer which claim the site is not viable and has caused them to offer an extraordinarily low level of so-called "affordable" homes - just 10% on the Tower Hamlets side and none on the Hackney side. We doubt the figures add up, and if they do, suggest now is not the time to develop. The Mayor of Hackney said it's own reports suggest 49% is achievable. But we can't see those either. You can see the redacted report in the video above. It tells us nothing of use. Even what it does show is both arithmetically wrong and uses dubious assumptions, which does not bode well for what we cannot see. Our full correspondence seeking disclosure is here.